Why does he even have one member at his church? The God I serve doesn't condone twisting the scriptures for gain. And He doesn't allow extortioners into the kingdom. So he's right, we don't serve the same God. I wondered when ol' Ronnie, (or "Pastor Floyd" as his sheep call him) would show up on your blog. I was a member of his church in my younger and more gullible years. He is the prototypical egotistical "celebrity pastor." I will never forget the time he called for a church-wide week-long fast. And when Pastor Floyd tells his sheep to do something, they do it. He is in every sense of the word an idol to thousands in his church. The week-long fast culminated in a Sunday night service where people were encouraged to confess to their sin of "leftover love." A handout was distributed among the thousands of all the ways the congregation was guilty of leftover love. And need I say what was at the top of the list - not tithing. I even remember that there was a screed about how people were guilty of tithing only on their wages and not their investment income also. I'll never forget this. At the end of the service, he told everyone to kneel down at their pews, and repeat after him. He then gave several, "I will" statements. Basically trying to program and brainwash his sheep while they were in the weakened state of hunger. I was thinking he must have read some book on brainwashing. I don't remember all of the "I will" statements but I remember this one like it was yesterday: "I will obey my spiritual leaders." And the sheep of course repeated it like mindless robots. That's when I knew something was seriously wrong with this church and with Floyd. I could go on and on with outrageous Floyd anecdotes, I just don't have the time or the stomach for it. Some years after I'd left his church I read about how a minor league baseball team was coming to the area, and Floyd encouraged his congregation to oppose the city's initiative to build a ballpark for the team because beer would be served at games. I'm sure he saw every dollar that his congregants plunked down on a baseball game to be a dollar that wouldn't go in the offering plate. This also made me remember about the time that he told the congregation about how one day he was walking through the airport hungry and smelled some popcorn in a bar, but he did the right thing and didn't go buy any of that popcorn because it was in a bar. Very strange morality. He has no problem manipulating and guilt-tripping his sheep into doing his bidding but buying popcorn in a saloon, that's evil. I just can't wrap my brain around that one. He says in his sermon that back in the Great Depression days giving to churches as a percentage of income was 3.5%, whereas now it's at 2.3 %. My first question is, how in the world could you have reliable statistics which would show how much was given to churches as a percentage of income in the early 1930's? But my second and more pointed question is, I wonder what the numbers are as to percentage of money given to churches which went to pastors' salaries and state-of-the-art "wow factor" facilities with coffee shops and arcades and health clubs, back in the Great Depression as opposed to now? In our church there is a history wall, and on that wall is a bulletin from the 1930s. In it the pastor announces that he is giving up a salary (because of financial strain of the Depression), and will simply take the offering from the fourth Sunday to support his family. At the end, he writes, "when you prosper, I prosper. When you starve, I starve. For we are one." I think this is a great example of pastoral humility and servanthood. I lived the first half of my life giving to God what was left. I have lived the remainder of my life giving at least a tithe.And getting close to 80. I have discovered that I cannot out give God. He means what he says and I cannot afford to not tithe. And no, I am not part of Ronnie's church.But yes , TV is full of hucksters, such as Todd Coontz and Mike Murdock. Just be aware when you give that it is going to the work of the Lord and not lining pockets. Some basic logic might help these guys: If trusting God with 1 penny of every dime shows you trust God, then trusting him with the dime itself would prove you trust him even more. So, give all your money to God, since that would really prove you trust him. OR, admit that percentages are not the best indicator of trust. Was in the radio business for a brief period of time after I retired and the station owner hoped he "would go to hell." Basically, wanted to see preachers like Floyd tossed into the fiery furnace.......he was serious. He had worked with numerous pastors wanting a Sunday morning show, but when it came to paying the bill, they were always the first, not to pay....liquor stores, used car lots, the casinos in Louisiana never missed sending the station a check for airtime....preachers? Well, see the above statement. I am glad that God has blessed you, but the notion that God blesses you in exchange for your financial giving, or any other type of giving on your part, is not Scriptural. The Bible clearly teaches that every blessing God gives us is solely because of His Grace, His unmerited favor. His Grace can't be bought with our sacrifice and efforts. Not only is it not Scriptural, it is also a very selfish notion, if you're giving so that God will bless you. In short God bestows His blessings without regard to what His children do or don't do. Any teaching that God is going to reward you if you give, and conversely is going to curse you if you don't, is pure heresy. It is not the concept of financial giving itself that is the problem here. It's the way Floyd and others like him twist and abuse Scripture to make the argument that as far as money goes, God is keeping a tight ledger. If you don't give that 10% then God has that deficit on His books and he's going to zap you for that, whereas He'll give you a handsome return for every penny you give, AS LONG AS IT'S AT LEAST 10%. This is the first abuse they commit. The second is using the money that is given to the church for frivolous things like their own six-figure salaries and entertainment-oriented church facilities. To ALL preachers, please read carefully and understand this simple point: "We do NOT trust YOU with our salvation. Therefore, we do NOT trust YOU with our finances!" Conversely, I don't trust YOU with my finances, therefore I don't trust YOU with my salvation. Please stop using that line of coercion on your attendees. It just doesn't make sense. Unless...you are saying you are the one that gives us our income and you are the one that saves us. Then, indeed, I would need to trust you for both. But the stark reality is, YOU want our money, not God. And you can't save us or bless us financially. Period. And some of us know it. It truly is amazing to me how many people sit there week after week believing and defending the tithing doctrine. Pointing out the error of this doctrine is tantamount to committing the unpardonable sin. One is labeled a "hater" if you try to use scripture to prove that tithing isn't required. Tithing usually goes hand in hand with obnoxiously overpaid preachers who teach a false prosperity gospel. He's got a bucket all right, and it's filled with something, but I can't really say what it is. Well, that's why the churches won't tell the congregations we are really in a depression now! It's easier to manipulate by saying if they give 10 percent, the world will change. All these churches do is go around screwing people up horribly. Mandatory tithing is NOT once taught in the New testament. It was an old testament ordinance, just like circumcision, and was done away with under the new covenant. But these "men o' gawd", as they call themselves continue to use the "office of a bishop", and their "spiritual authority" to demand that people give them a tithe. ex-tor-tion: the crime of obtaining money or some other thing of value by the abuse of one's office or authority. So if these men are using their office of a bishop, and their spiritual authority to get money that they are not biblically allowed to get, then they are EXTORTIONERS! And what does the bible say about extortioners? So he is right in what he is saying. Since he will not inherit the kingdom of God, he does not serve the God of scripture, but rather the God of filthy earned money. So how should the Christian respond to these type of false profit prophets? Come out from among this harlot Babylonian religious system, and be ye separate. This is actually financial legalism he is teaching. I was beating my head recently trying to figure out how to be financially savvy and the LORD made me realize that ALL I needed to was to be financially responsible and make good decisions. Giving to your church first is actually never taught by Paul at all. He instructed Timothy to instruct congegants to take care of family members in need first. As a congregant gets blessed financially and family staples are met then those in the assembly can be given to. Sadly tithing doctrines perverts something far worse, the lack of caring for thy neighbors welfare and that ten percent is good enough via the elders. So the rest I can be selfish with??? He has no consistent hermeneutic. He does not understand the defintion of holy tithe under the law. He does not know that Gentiles never were under that law. Hey guys, stop being anonymous and stand up to make yourselves heard louder. Al Mohler just nominated Floyd as a candidate for president of the SBC. I'm not a member of this church, but I FULLY 100% believe the TRUTH of the WORD OF GOD and the BIBLE says to TITHE to GOD. End of story. I am a living testament that whenever I do and push past what I know I cannot afford, GOD ALWAYS takes care of me above and beyond what I could have ever imagined. When I don't listen, and I give in to the devil in my ear saying, "you just can't afford this" I don't tithe, and guess what, I can't seem to make ends meet PLUS I am without the extra blessings from God in other ways that He would have blessed me from my faith as well! The cowardly anonymous holler the loudest. Gentiles are under the entire Bible not just the New Testament. The widow gave all.she had to the church and Jesus rebuked the wealthy for not tithing using her as an example. Well said Amy!! I am a cheerful giver! The Bible says to tithe and I stand by that. Read all thirteen books of the apostle Paul. I challenge you to find where he instructed the Gentiles to pay any Tithes to anybody. Tithes were not originally meant to be monetary, they were to come from the land and could only be paid to the Levites. Additionally, under the new covenant, He no longer dwells in temples made by hands. WE are now the temple of the living God. You'll never hear that on Sunday morning over at SixFlags over Jesus. And now Floyd is the president of the Southern Baptist Convention, with Albert Mohler's explicit approval. Several years back this very man was involved in filing a lawsuit on behalf of the church in Springdale over non tithing by a family that had lost everything to a fire. There were several writeups at the time, would love for someone to find a link to the article to share it. Wish I could. Dr. Floyd is speaking on the subject of tithing which is commanded for all believers. To ask the church to give ten percent is only doing what God has already asked of us. Tithing was in place before during and after the ministry of Jesus. I have found that the only people who complain about a pastor speaking on giving are those who don't give. Since Ronnie was elected to the SBC presidency, I wonder how many arms got twisted and how many pastors and others were treated to underhanded backstabbing as in Arkansas several years ago. Read the article on "good ole Ronnie" by David Montoya in "Leaving the Fold: Testimonies of Former Fundamentalists"
Tithing is biblical--please read Old Testament. Very clear. New Testament does not talk about tithing specifically. But if you read the Sermon on the Mount (most famous sermon ever given) it amplifies the law--the law is just a STARTING POINT--we are to go above the law in our fulfillment of obligation to Jesus. Do you disagree? I was there in the 90s with my grandparents, I have never before, nor after, seen any one ( I will not call him a pastor) say with a finger in the air "God says, ATLEAST 10%" unquote. I would really like to see cross churches budget, I know of nothing that this church does for charity or gives back to the community. Most of all, I would like to see his tax return and how much of that at-least 10% he's poketing, let alone payed out, I would bet my entire salary that it is not 10%, let alone more. We are living in the New Covenant and the old covenant is obsolete when we read the book of Hebrews. As believers of the new covenant church, it is not the matter of 10% or 20%, we need to give ourselves to God. It can be 5, 10 or what ever percentage that God wants us to give wholeheartly with out any compulsion, or obligation or as a tradition or system. Most of the preachers who force their congregation to give are selfish and they do not teach the truth of sacrificial giving. "Why does he even have one member at his church?" Because Tom, deep down, we think we are saved by the institutional church membership. Why does Dr. Mohler embrace guys like Dr. Floyd and Dr. Moore? Amy Hall, thank you. You are so right. The Cross churches do wonderful things with money that is tithed. This blogger that is bashing Ronnie Floyd doesn't have a clue what he is talking about, nor do the people commenting on this blog. Shame on them for judging someone or a Church they know nothing about. The blogger's time would be better spent doing 1/10 the good that Ronnie Floyd has done for others. I am disgusted at the lies and comments on here!!!! Thank you Amy Hall for the truth. Which seems to be lacking on this blog. Cross Churches and Ronnie Floyd have and do wonderful things with the tithing. If people are not tithing then they should be reminded to do so. Shame on the blogger and those that are judging Ronnie Floyd and Cross Church. They are judging someone they know nothing about!!! I was a member at the then-First Baptist Church of Springdale, Arkansas when Ronnie Floyd arrived (don't get me started on his pushing the congregation to rename itself "CrossChurch" - makes me wonder what they're mad at, by the way, in addition to being Ronnie's aversion to being called a "baptist"). I walked out after about 1-1/2 years of it - I couldn't stand his unscriptural teaching, methods, egotism, and willingness to destroy anyone who stood in his way of promoting HIMSELF. Well, he WASN'T! If you go to the library at Southwestern Theological Seminary in Ft. Worth and look at it, (and, yes, I have), you will find it is all about MONEY! Getting people to give MONEY! That's it - plain and simple. There is not one sentence about "church growth" in it at all - just about getting people to give more MONEY! After all, that's what fuels Ronnie Floyd's egocentric, unbiblical theology and practices: MONEY! For, MONEY is what it takes - and LOTS of it - to accomplish his goal of promoting HIMSELF, because that's what he's all about - promoting Ronnie Floyd, and ANYTHING that will do so is GOOD, and anything or anyone that hinders his goal is BAD, and must be destroyed. 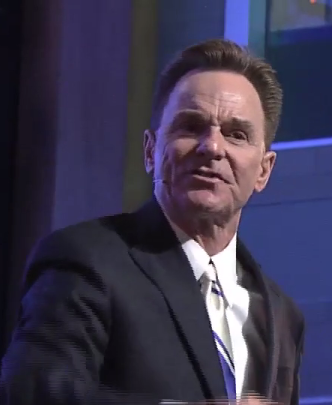 Ronnie Floyd is a manipulator, a liar, and a false prophet, and it's really sad that he destroyed the great church that God built during the 16 years of Cliff Palmer's pastorate prior to Ronnie's descending upon Northwest Arkansas. He's a piece of junk. Another drop in the bucket of junk Christians in it for the money.